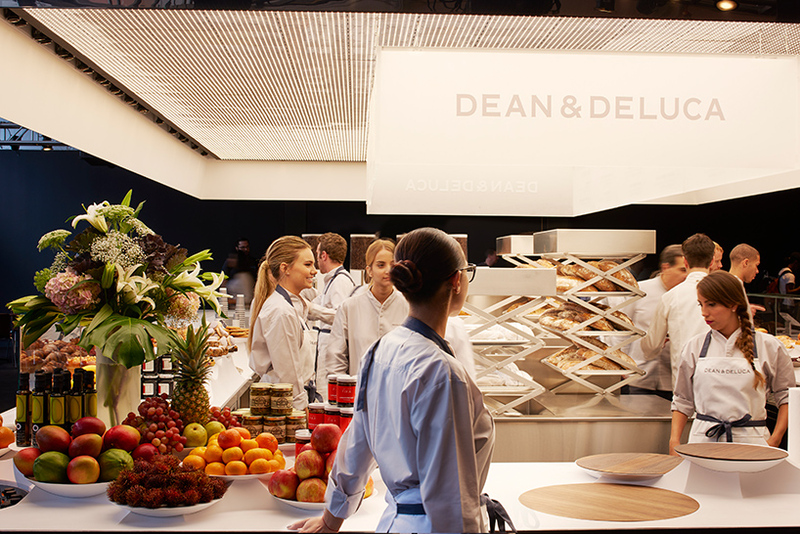 designboom – Carbone Metal Fabricator Inc.
At design miami 2016, ole scheeren introduced a dramatic chef-led fast food concept for dean & deluca. 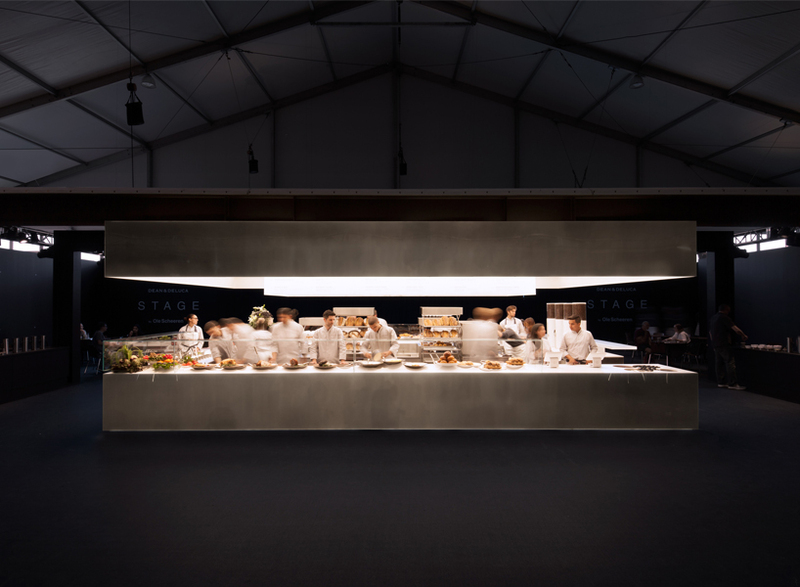 aptly named ‘stage‘ for its spectacle-like sensibility, the installation is conceived as a pristine object that celebrates food. the unit is realized in the form of a rectangular, mirrored stainless steel volume that reflects varying views of its surrounding environment. 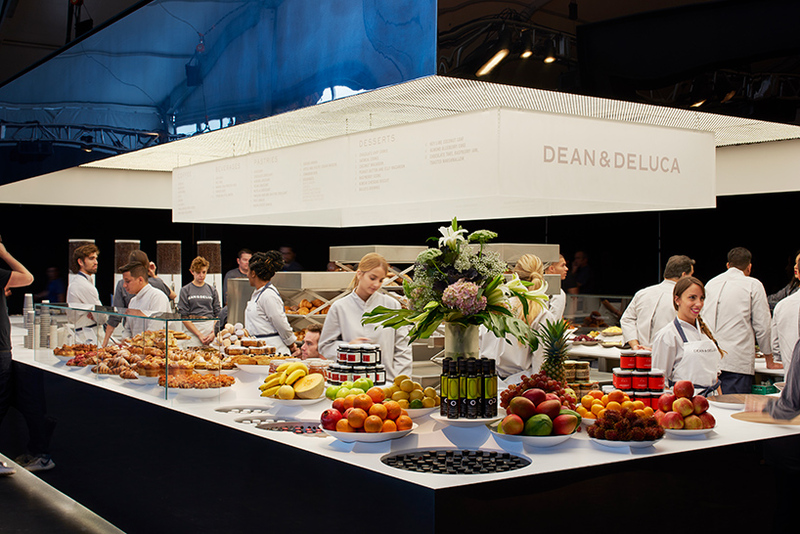 the almost theatrical platform aims to highlight both the customer and the staff equally, elevating the eating experience in an exciting and engaging way. We spoke with scheeren about the concept behind ‘stage’, the process of creating the installation, and the experience of bringing it to life at design miami. Expanding dean & deluca’s reach in key north american cities, ole scheeren’s ‘stage’ at design miami comprises two horizontal plates, one floating above the other on a cushion of glowing light. 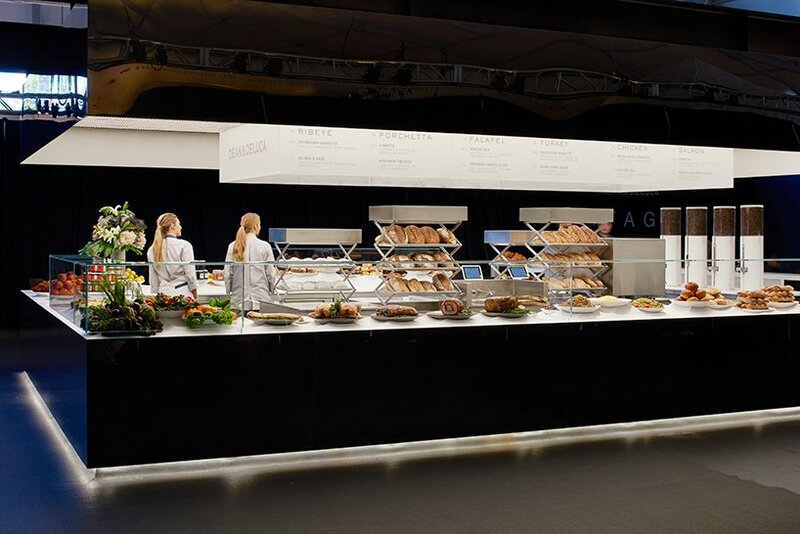 this elevated platform allows both customers and staff to freely move around it, encouraging social interaction and communication as people watch their food being prepared, or simply order a coffee. 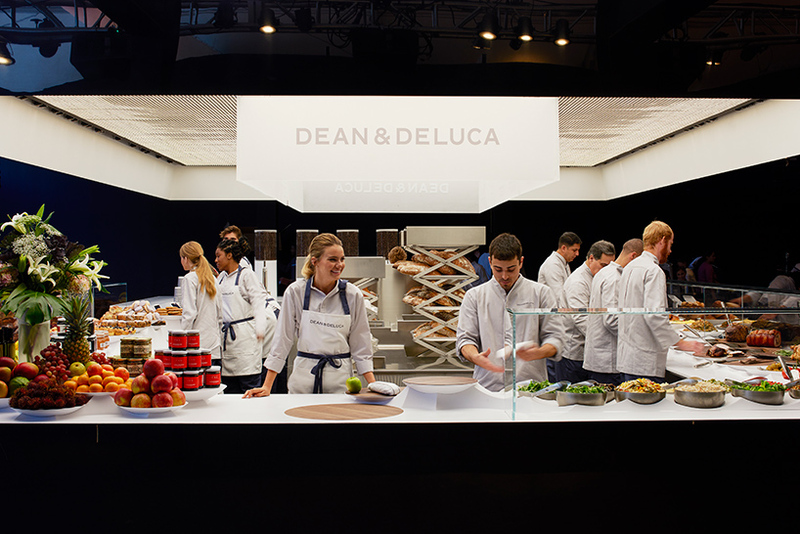 food is displayed on an undulating topography of white corian that unfolds as a landscape of ingredients, while the complex functions of kitchen equipment and technology are invisibly integrated into a high-tech display system. 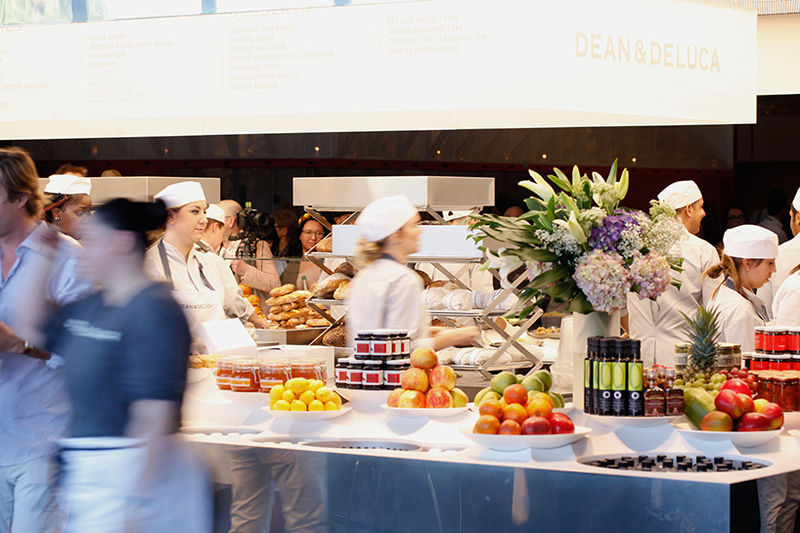 behind the scenes, those working are elevated to the role of a ‘cast’ as they move about the space, creating an interactive environment where making, offering and consuming is celebrated and enjoyed. 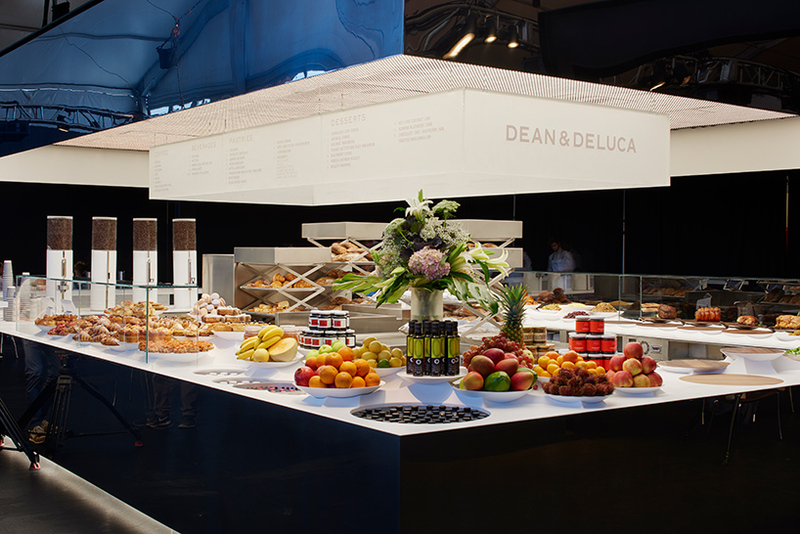 Designboom(DB): how did the collaboration with dean & deluca come about, and what kind of brief were you given for the project? Ole scheeren (OS): in a way, it came through a different project that we were collaborating on at the time, which was MahaNakhon — the tower in bangkok. 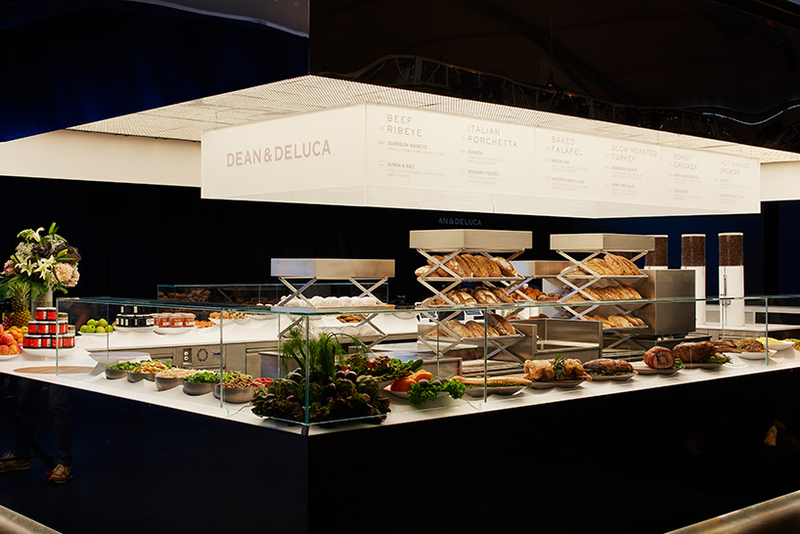 we brought dean & deluca into the pavilion that we built, before the building was there to activate the site, and it was such a success that it ultimately led to the acquisition of the brand, and, in a way, jointly envisioned a future for it. 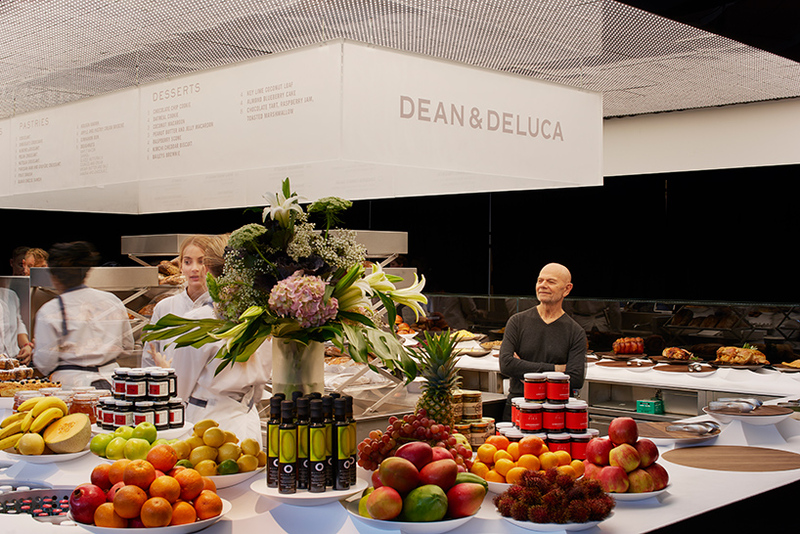 DB: how does the concept expand upon, or even move away from, what dean & deluca is doing currently? OS: first of all, it’s a new format, so the existing delicatessen grocery markets will remain. this is really a smaller, chef-led fast food concept that we’re developing for a higher number of applications to increase the region accessibility of the brand. DB: can you describe the concept of the setting and the sense of theatrics at work? 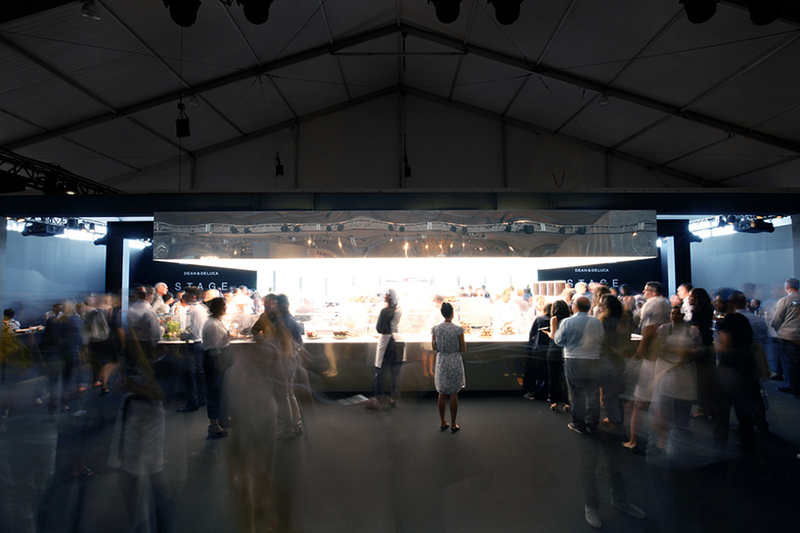 OS: I called it ‘stage’ because I thought it was important to elevate everything related to it — the food, the consumption, the making of the food, the people that make the food — and of course, to integrate the customers into a joint spectacle of an intense experience. it’s a very simple object in a way: it’s a box, but it’s a free standing object which means people can circulate around it. it acts a bit like a social magnet in the center of the space. you can watch the performance if you like the spectacle. you can approach if from different sides for either made-to-order sandwiches or salads that take a bit more time. there’s a faster lane to just grab a coffee if you want to be quick. it’s really an idea of celebrating food in many ways. DB: what was the process like of realizing ‘stage’ from start to finish? you’ve said there was a 1:1 scale model made? OS: we developed a lot of different concepts and ideas, and I think it crystallized very clearly that this notion of the stage was the most powerful reference to relate to. at the same, while this object is quite consistent and simple, it allows us to insert it into a diverse range of contexts and different spaces. we are not building all the buildings for it, but we are going into existing spaces. I feel it’s important and interesting to acknowledge that we didn’t create those spaces, but that they are also a locally-specific reality. (continued) we want to maintain every space we find and simply work with the character of what we find, and then insert this extra object into the middle of it. I think this works very well because of the simplicity of the object and because of the materiality. it’s a box in mirrored stainless steel, so it simply reflects the environment that it’s situated in. it dematerializes itself and leaves the focus really on this energy center of the glowing light inside. DB: can you describe the topography you’ve created and how the different foods are displayed? 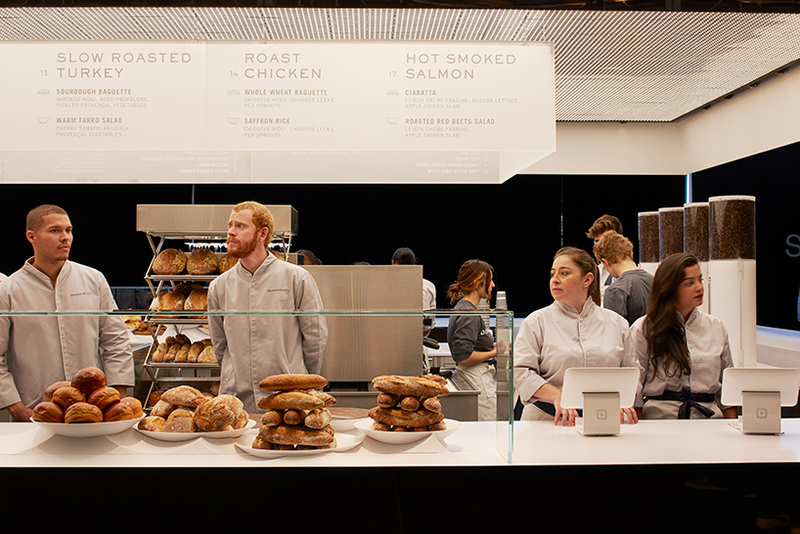 OS: I thought it was very important not to present food as a mechanical assembly line, like many made-to-order realities. actually when you look closely at them, they look rather horrible and not enticing. 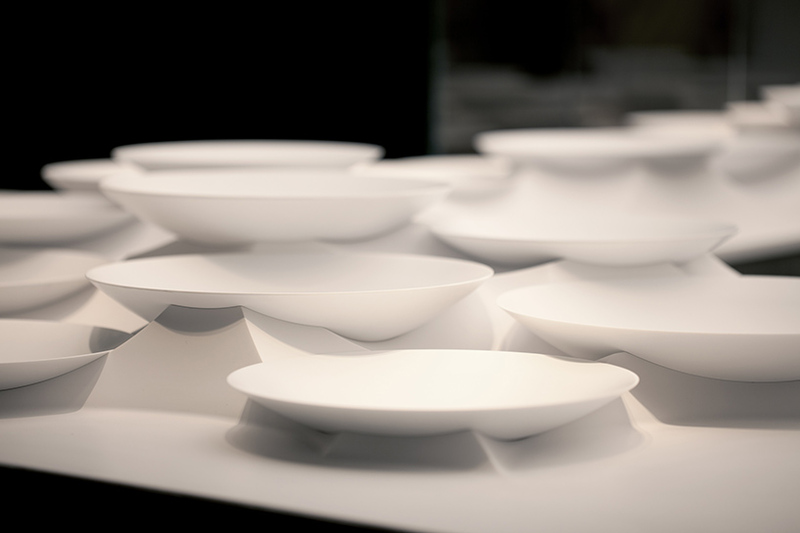 I wanted to see food more as a kind of offering, with floating plates of different types and a really dramatic landscape of food and ingredients that we display. I think that shows the quality of the food and the attention given to everything in the process of making. DB: as an architect, how differently do you approach a project like this? OS: architecture is always an interplay for me between function and fiction. it’s really the idea that buildings of course have to work, and have to have a function. they are also, for me, organizational structures, with really structured processes and relationships. at the same time, we want to manage how people live in them and with them. I think this is very similar between different scales, in the ambition of really amplifying or enlarging the possibilities of what these things do. certainly working at this scale allowed us to work in a very different way to architecture — to build 1:1 prototypes; to test the actual processes before they are translated in a final version. even this is our final stage prototype here in miami to test all of its processes. it’s amazing to see how well it is working actually. DB: it is working really well. 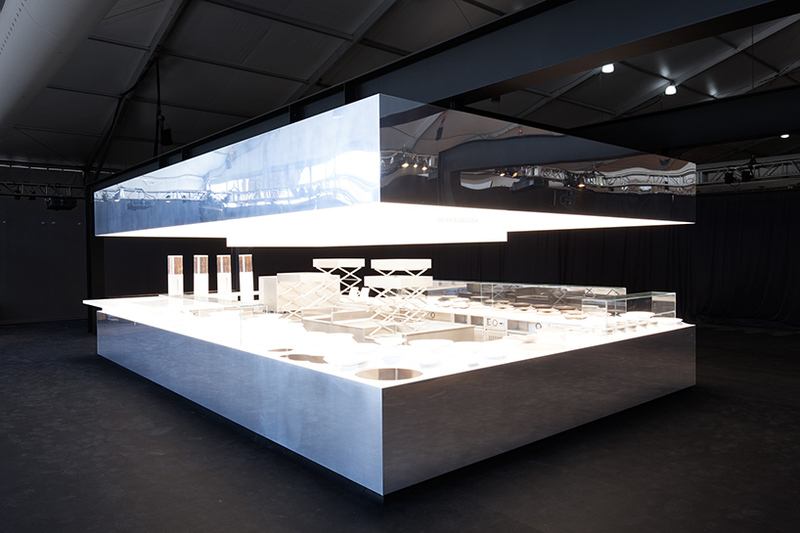 how does it feel to finally see it come together here at design miami? OS: I’m really happy because I really think the energy that I imagined would be there, is there. I feel that the people inside of it are really elevated to a cast of actors that represent something, and that they also enjoy what they are doing — that is very important to me. not only to care about the customer on one side, but really to care about both sides. I think to elevate that action is something that is ultimately very valuable.